Seasonally averaged quiet-day F region ionospheric E × B drift observations from the Millstone Hill, St. Santin, Arecibo, and Jicamarca incoherent scatter radars are used to produce a model of the middle and low-latitude electric field for solar minimum conditions. A function similar to an electrostatic potential is fitted to the data to provide model values continuous in latitude, longitude, time of day, and day of the year. This model is intended to serve as a reference standard for applications requiring global knowledge of the mean electric field or requiring information at some location removed from the observing radars. This article contains supplementary material. Richmond, A. D., M. Blanc, B. 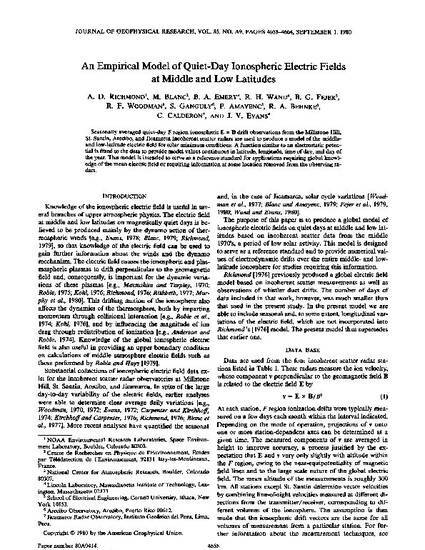 A. Emery, R. H. Wand, B. G. Fejer, R. F. Woodman, S. Ganguly, P. Amyenc, R. A. Behnke, C. Calderon, and J. V. Evans, An empirical model of quiet day ionospheric electric fields of middle and low latitudes, J. Geophys. Res., 85, 4658, 1980.